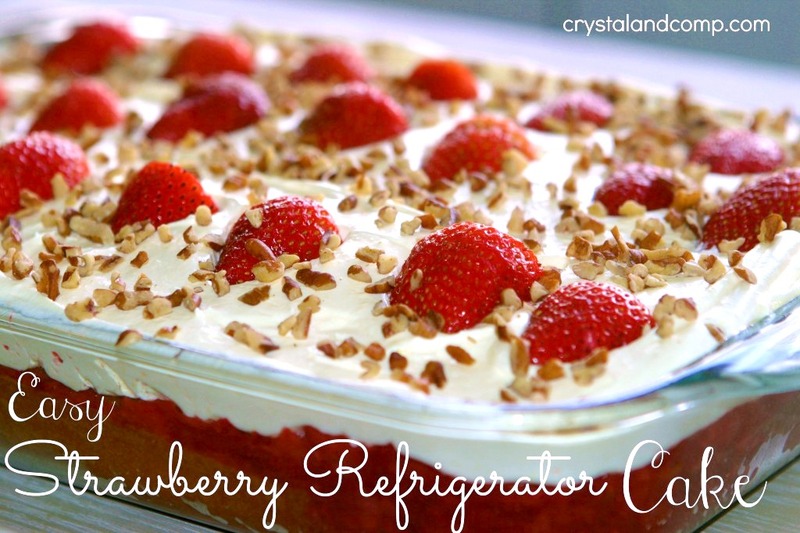 Strawberry cake has become a dessert that everyone in our house loves. 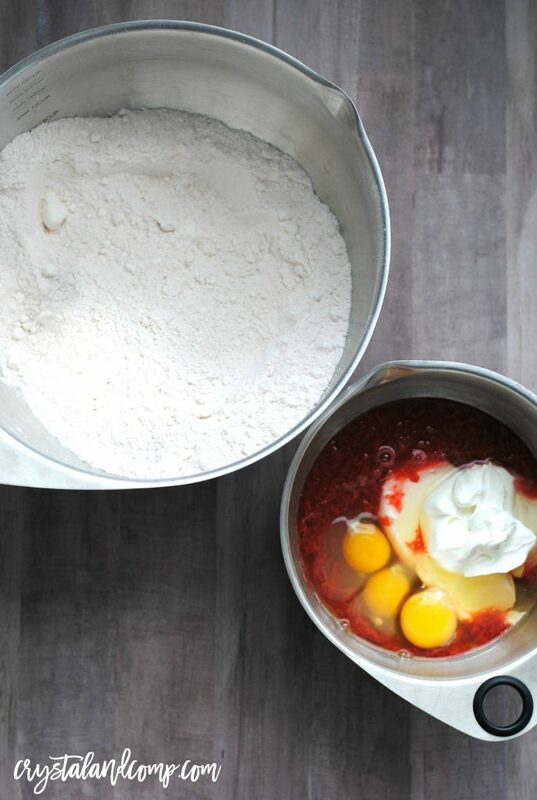 You may not realize just how easy it is to make from scratch. 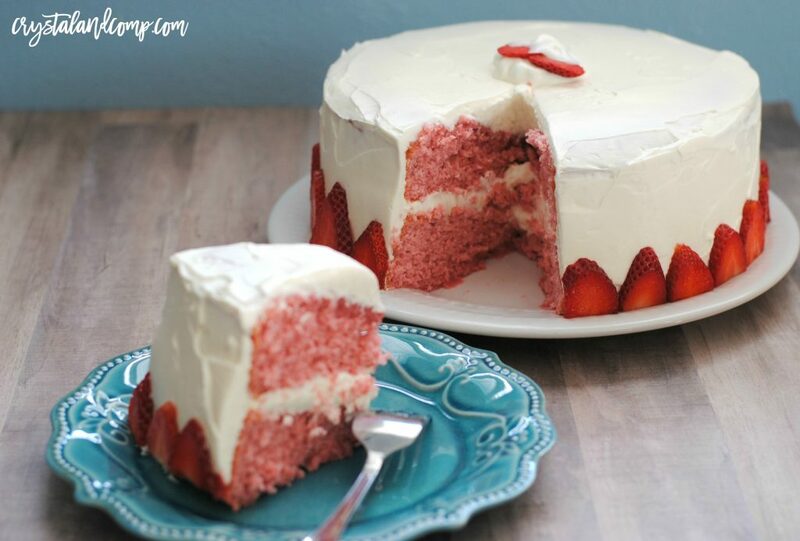 This strawberry cake recipe is one that is perfect for your next get together, a special occasion, or just because. There will not be a single slice left. Gather up all of your ingredients. We have them broken down by cake, puree and the frosting. In a small pot (we love this one) bring strawberries, sugar, and water to a boil for one minute. In a large mixing bowl (we love this set) combine white cake mix, strawberry jello mix, sugar, and flour. In a small bowl combine cooled strawberry puree, sour cream, and eggs. Pour wet ingredients into dry ingredients and mix on low until combined. Beat on medium-high for 2 minutes. You could also use your standing mixer for this. I have had mine for a decade and it runs like it’s brand new. I have the Classic Plus. Pour batter into greased 9in round baking pans and back 35-40 minutes until toothpick comes out clean. Now it’s time to make the frosting. While cakes are cooling, beat cream cheese in a large bowl for about 15 seconds. Add in sugar, salt, and vanilla extract; beat until creamy. Slowly pour in heavy whipping cream and beat on medium-high until stiff peaks are formed. Place in refrigerator if cakes are still cooling or frost immediately. 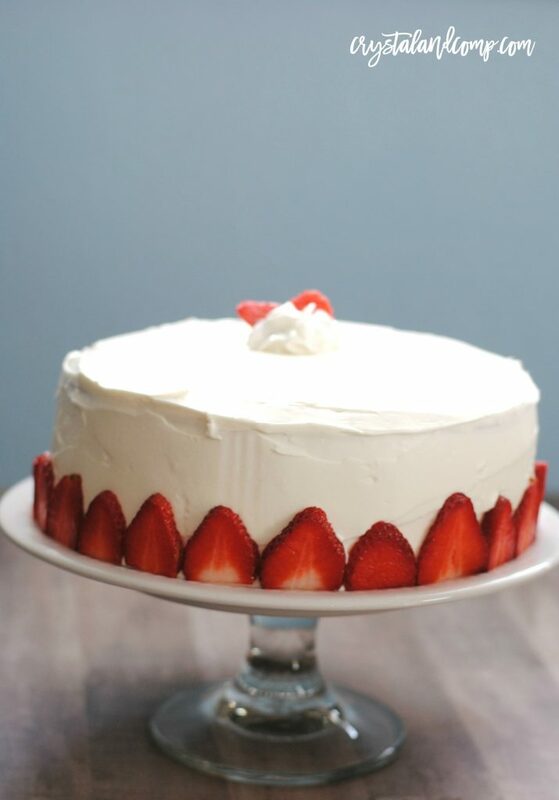 Use think slices of strawberries to decorate the side of the cake like we did. It’s such an easy way to make it beautiful. 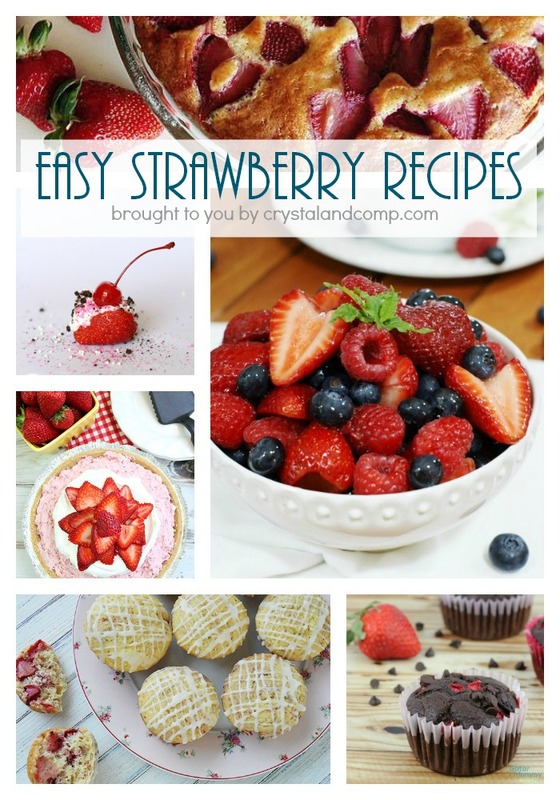 Decorate with extra sliced strawberries and serve. Isn’t that so simple? It really is easy to make it from scratch and anyone can do it! 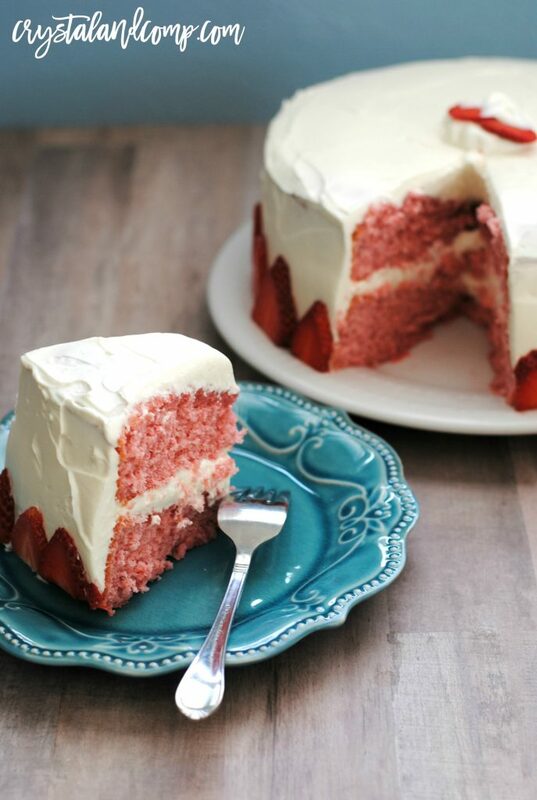 This homemade strawberry cake is lush and so easy to make! Preheat oven to 325 degrees.In a small pot bring strawberries, sugar, and water to a boil for one minute.Let cool completely.In a large mixing bowl combine white cake mix, strawberry jello mix, sugar, and flour.In a small bowl combine cooled strawberry puree, sour cream, and eggs.Pour wet ingredients into dry ingredients and mix on low until combined.Beat on medium-high for 2 minutes. You could also use your standing mixer for this. Pour batter into greased 9in round baking pans and back 35-40 minutes until toothpick comes out clean.While cakes are cooling, beat cream cheese in a large bowl for about 15 seconds.Add in sugar, salt, and vanilla extract; beat until creamy.Slowly pour in heavy whipping cream and beat on medium-high until stiff peaks are formed.Place in refrigerator if cakes are still cooling or frost immediately.Use thin slices of strawberries to decorate the side of the cake like we did. Mmmm…I love strawberry cake and this one was delicious and full of strawberry flavor. This sounds delicious and looks sooo pretty! I can imagine why there isn’t a slice left behind! 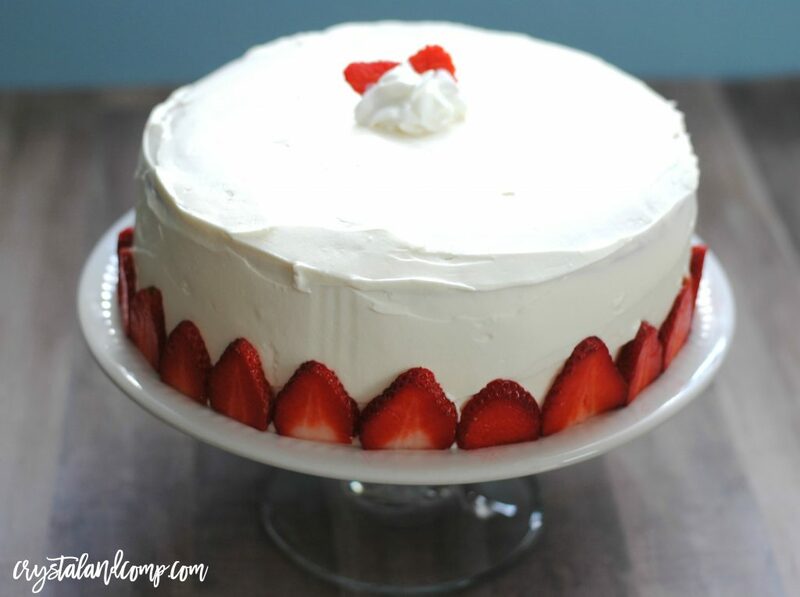 My daughter loves strawberry cake and has requested it for her birthday cake for the past few years. Such an easy recipe and so pretty too!